Teach your patients about pain; research shows they will feel less pain, have less fear, move better and show more interest in therapy. This all-inclusive system delivers immediate clinical application of pain neuroscience education. Physical therapist Adriaan Louw's Why You Hurt: Pain Neuroscience Education System refines complex neuroscience into easily internalized metaphors, examples and images to efficiently teach your patients what pain really is and how it works. Over a dozen versatile education sessions cover a wide variety of patients. 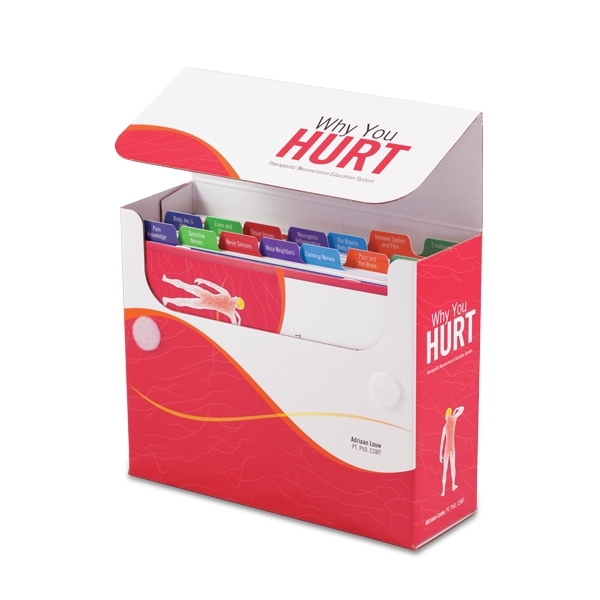 120+ illustrated education cards are intuitively separated into common chronic pain topics. Teaching cues guide each session. Beginners can deliver the cues directly; after practice, cues function as guidelines. Homework promotes deep learning and empowers patients with an active role. Includes 50 reproducible homework cards; photocopy the cards or download electronic versions*. 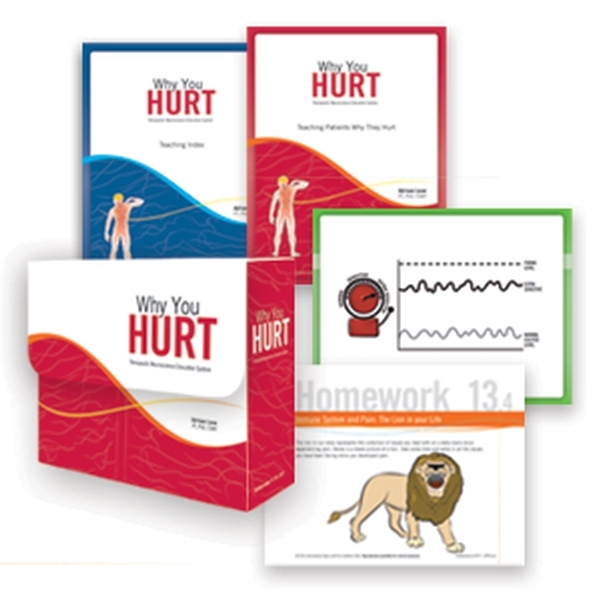 Pain questionnaire cards supplement education sessions or homework. 12 questions help unveil how patients conceptualize pain. Teaching index ensures accurate selection of session topic. It details each section's message and offers a list of associated clinical issues. Instructions and background of pain neuroscience education. Here's the how and why of TNE, including the impressive research behind it. Adriaan Louw's Why You Hurt system is much more than pain flashcards. This integrated system, based on best evidence research, gives you the knowledge and tools to treat chronic pain patients right out of the box. 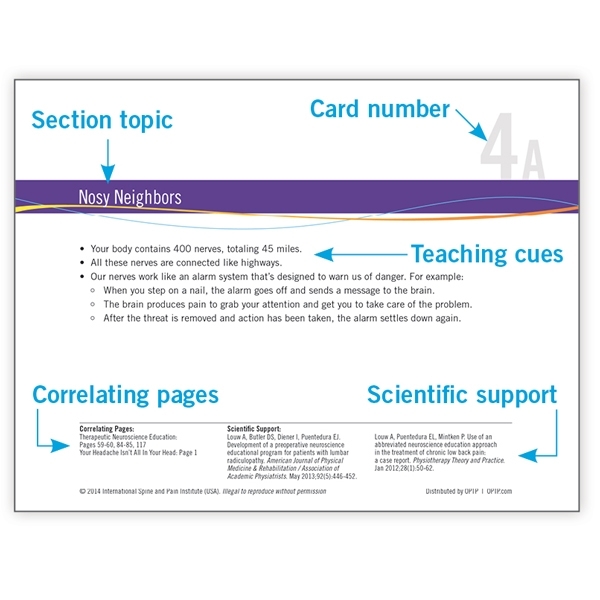 System includes 120+ full-color, two-sided education cards with teaching cues and scientific support, 50 reproducible and downloadable homework cards, 12 pain questionnaire cards, detailed instructions, discussion of TNE and a teaching index. Cards measure 8½" x 6½". Non-returnable. A valuable companion to the Why You Hurt system, Adriaan Louw and Emilio Puentedura's Pain Neuroscience Education: Teaching Patients About Pain; A Guide for Clinicians offers in-depth study of pain neuroscience education (book sold separately). *Downloadable homework available here. Username and password included with system.